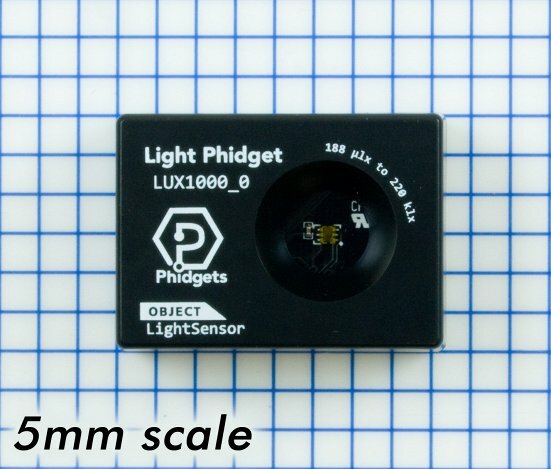 This handly little sensor measures the amount of light shining on it, making it a perfect addition to automated systems that need to switch on at night or in low-light conditions. It has a wide measurement range from 188 microlux (starlight on a moonless night) to 220,000 lux (direct sunlight). It connects to a VINT Hub port with a Phidget cable. Have a look at the Connection & Compatibility tab for a list of options. 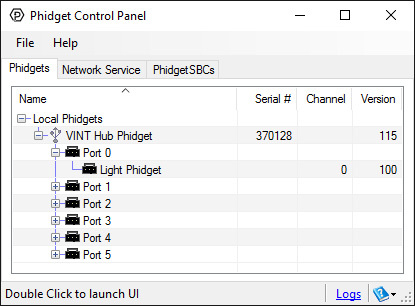 Connect the LUX1000 to the VINT Hub using the Phidget cable. Now that you have everything together, let's start using the LUX1000! In order to demonstrate the functionality of the LUX1000, the Phidget Control Panel running on a Windows machine will be used. Linux users can follow the getting started with Linux guide and continue reading here for more information about the LUX1000. 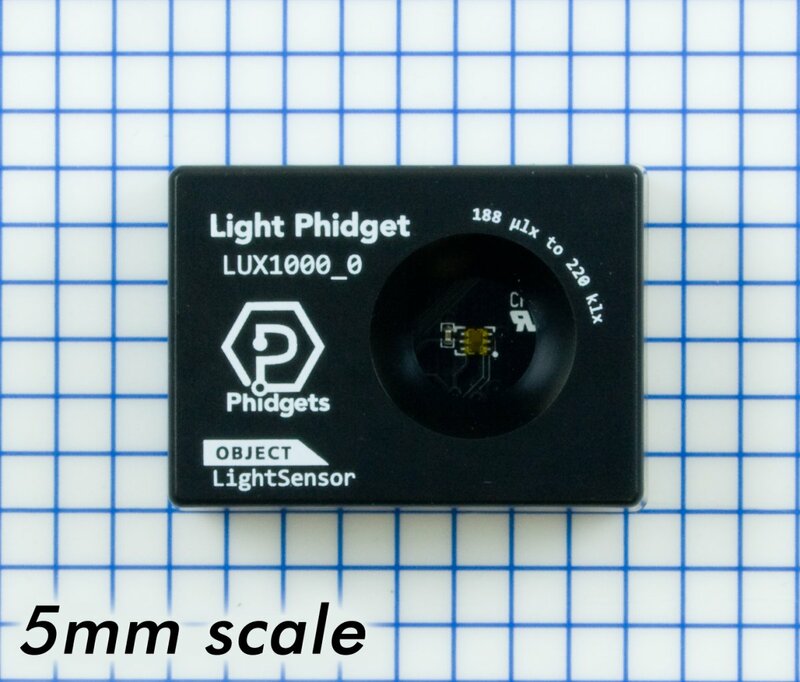 This Phidget is compatible with the LightSensor Examples. Current consumption on the LUX1000 is dependent on the sampling interval you choose. More current is used for frequent samples. 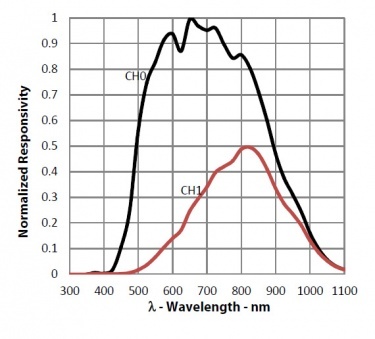 The response of the photodiodes depending on the wavelength of the incoming light. Because of these dynamic ranges, you may see momentary saturation when trying to measure large changes in light intensity in short periods of time (for example, a strobe light). Once the light level stabilizes though, the sensor should be able to settle back into optimal range settings. The light sensor on the LUX1000 is designed to sense light in a way that emulates the response of the human eye. However, digital light sensors work very differently than our eyes do. Using the photoelectric effect, the photodiodes in the sensor will generate current when struck by incoming photons. The problem is that the range of wavelengths that these photodiodes respond to vary depending on what materials they're made of, and none of them have the same response as the human eye. The solution offered by the chip used in the LUX1000 is to take readings from two different photodiodes; one that detects only IR light (which is invisible to the human eye) and one that detects both visible and IR light. Once it has these measurements, it weights them with coefficients based on calibration testing, and then subtracts the IR component from the diode that detects both IR and visible light. The result is a workable approximation of brightness as seen by a human eye. * - Current consumption varies depending on selected data interval. See the technical section of the User Guide for details.